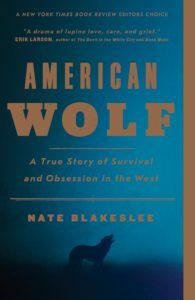 Our October pick for the PBS NewsHour-New York Times book club, “Now Read This,” is Nate Blakeslee’s “American Wolf.” Become a member of the book club by joining our Facebook group, or by signing up to our newsletter. Learn more about the book club here. 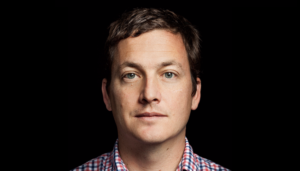 When Nate Blakeslee’s first book, “Tulia,” came out in 2006, it won the J. Anthony Lukas Book Prize and was called one of the best books ever written about a wrongful conviction. A decade later, Blakeslee is back with his second book, this time an ambitious biography of a wolf, which was again shortlisted for the Lukas Prize. “American Wolf: A True Story of Survival and Obsession in the West” tells the tale of O-Six, a Yellowstone alpha female who became known as “the world’s most famous wolf,” and the people and politics that surrounded her. 1. What is your daily writing routine? I am tempted to respond N/A and leave it at that, but there may be some editors reading this. Still, do we really want to begin with a lie in the first answer? No. The truth is that I have struggled with routines over 20 years of magazine and book writing. Worse than some I know, not nearly as bad as others. When things are going well, I write 1,000 words before lunch, and then tinker with that material for a couple of hours in the afternoon, during which it hopefully gets a little better or longer, but doesn’t always. Everybody says this, because it’s true: Get the first draft down, even if you know it’s bad. Everybody says this, because it’s true: Get the first draft down, even if you know it’s bad. It will get better. I think procrastination for some writers is really a form of perfectionism. Right up until you actually type that first sentence, it could be the beginning of the greatest paragraph ever written. Some part of you doesn’t want to start writing because you know that when you actually do, that first sentence and the paragraph that follows will turn out to be like the rest of your work — not the best, but not the worst, either. 2. What is your favorite childhood book? Or one book you think everyone should read? 3. What is something you’ve seen, watched or read that you think is overlooked and deserves more attention? I’m a big fan of documentary. When I was in my 20s I would watch almost any documentary film I could find, which in those days involved hanging out in well-curated video stores and asking for recommendations. Are those stores making a comeback? If not, how do people find the classics of the genre? I remember two in particular that changed the way I looked at the world: “Harlan County USA,” about striking coal miners in 1960s Kentucky; and “Manufacturing Consent,” an introduction to the work of Noam Chomsky. I also used to read a lot of oral histories, like Studs Terkel’s “Working,” in which he simply let people talk at length about their jobs, a deceptively simple conceit that led to wonderful insights on class, politics, and much more. Now that I’ve spent countless hours interviewing people myself — and watched my Texas Monthly colleagues (Pam Colloff and John Spong in particular) produce wonderful oral histories for the magazine — I realize that most people don’t really talk the way they do in Studs Terkel books. (Terkel, or his editor, did a lot of polishing.) But I still love the idea of listening to people and presenting what they tell you — either on film or in print — in a relatively unfiltered way. 4. What is the best piece of writer’s advice you’ve received? 5. Can you describe the moment you knew you wanted to write this particular book? And when did you know it was over? The seed of this book was planted during my first trip to Wyoming, 28 years ago. My college friends and I got into the habit of driving from Austin to the tourist town of Jackson, Wyoming, every summer, working in town and rock climbing or hiking in the Tetons on weekends. To save money, we slept in tents in the national forest just outside of town. (Rent in Jackson was ridiculously high, even then.) I remember it as one of the happiest times in my life, and I looked for an excuse to get back out there for years afterward. I finally did go back in December of 2007, when I took a wolf-watching class in Yellowstone. I had never seen a wolf before, because there weren’t any in the northern Rockies the last time I was there. Wolves had been reintroduced — controversially — by the federal government in the mid-1990s, roughly seventy years after the last few were killed by fur trappers and ranchers protecting livestock. After an amazing week of watching wolves hunt elk, romp across the snow, and howl to one another across the park’s stunningly beautiful peaks and valleys, I knew I wanted to write about them — and about the political fight over how wolves should be managed, which has become one of the most acrimonious debates in the West. Twenty years into the reintroduction experiment, powerful forces were pushing to remove federal protection for wolves, which would allow them to be hunted and trapped once again. The ending point of a book-length work of journalism is inevitably a moving target. But the book didn’t come together, because I wasn’t sure how to tell the story. That changed in the winter of 2012, when I heard about the Yellowstone wolf known as O-Six. The celebrated leader of the park’s most visible pack, the gray alpha female was a favorite of hordes of wolf-watching tourists, as well as the small group of biologists who monitored the park’s wolves. She had by that time become arguably the world’s most famous wild animal, but her pack’s future was uncertain. Wolves across the northern Rockies had just been removed from the endangered species list, and Yellowstone’s successful reintroduction program felt very much under siege. The idea hit me: Why not tell the saga of the battle over the West’s most iconic animal by following the life of a single wolf and her pack? Why not write the biography of a wolf? How do you know when a book is finished? The ending point of a book-length work of journalism is inevitably a moving target, since events are still unfolding as you are doing your reporting and writing. But building the book around O-Six’s story gave it a nice narrative arc, one with an ending so dramatic that I still find myself moved by what happened, even as I sit here writing this a year after the book was published. I hope readers will feel the same way.